In 2011, the cost of creating, capturing, managing and storing information was down to 1/6 of what it was in 2005. Since 2005, annual investment – money spent to create, manage, store and derive revenue from the digital universe – by enterprises has increased 50% to $4 trillion . The world’s information is doubling every two years, with an astonishing 1.8 zettabytes being created and replicated in 2011, according to a new IDC report. The demand for talented people who can analyze and visualize little data or big data is growing exponentially. In its recent report, “Big data: The next frontier for innovation, competition and productivity”, McKinsey Global Institute estimated that a retailer using big data could increase its operating margin by more than 60%. The U.S. could reduce its healthcare expenditure by 8% and government administrators in Europe could save more than 100 billion euros ($143 billion). The scenarios presented by McKinsey sound plausible but there is a slight catch. Who is going to do this work that will extract insights from vast pools of data to drive revenue growth, or process improvement savings? We are seeing a significant shortage of talent that can do simple business analytics (e.g., data correlations). Explaining demand for analytics….. Arnab Gupta, CEO of Opera Solutions states, “We live in a world where computers, not people, are in the driver’s seat. In banking, virtually 100% of the credit decisions are made by machines. In marketing, advanced algorithms determine messages, sales channels, and products for each consumer. Online, more and more volume is spurred by sophisticated recommender engines. At Amazon.com, 40% of business comes from its “other people like you bought…” program.” (Businessweek, September 29, 2009). Business analytics uses data to drive operational execution, business strategy and performance. The ability to process vast flow of data in real-time is becoming a business imperative and in some cases a competitive differentiator. Analyzing data in real-time in these following initiatives/projects is where the leading firms are innovating around. Almost every global company has initiatives or projects that fall into some or all of the above. We’re increasingly building analytical models to predict things that will happen in the future. To achieve the next step in efficiency it’s necessary to build data mining, machine learning, optimization algorithms for every business process. Getting insights from streams of data (for instance, retailers performing sentiment analytics by “listening to” social media data) at a lot of companies requires a sophistication that is not easily to achieve. Also as every field looks for an advantage analyzing data the talent is getting dispersed. The hedge fund industry is absorbing a lot of modeling talent. The sports gambling industry like football or baseball betting also absorbing talent. At the same time we are seeing new techniques emerge around social media marketing that are absorbing new analytics talent. Take for instance, Facebook as a brand, fan, like, dislike, sentiment platform. With over 700+ million members, Facebook represents the largest, real-time collection of data ever gathered about consumers. With information about individual preferences, interests and demographics, Facebook consumer data offers enormous potential to marketers. But, for many brand and marketing executives, Facebook is unfamiliar territory with (Likes, Pages, Walls, etc.) and tools to engage Facebook users, such as Facebook Ads and Insights. The challenge for corporations is finding and training the talent that is business savvy and comfortable with statistics, programming and mathematical analytics. 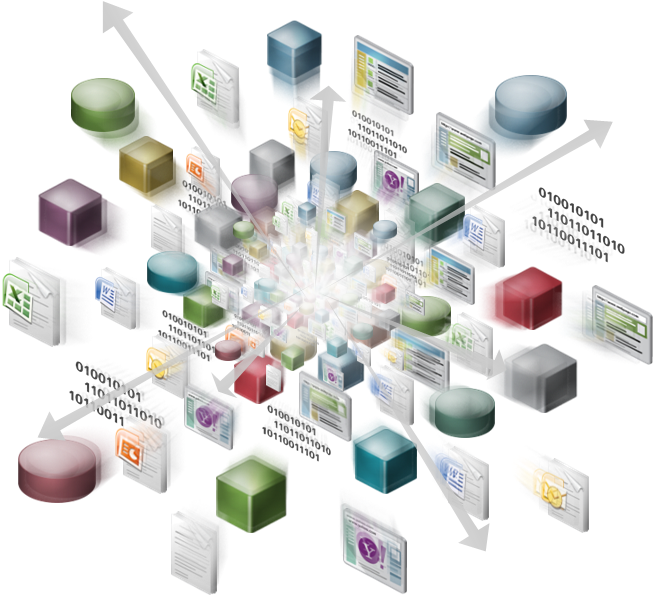 What bleeding edge firms are discovering is that automating the flow of information is simply the first step, but even more important is the ability to have the necessary human talent across the stack that can handle the data infrastructure, integrate the data from different sources, and create the algorithms to react in real-time to data and structure experiments to learn from user behavior. 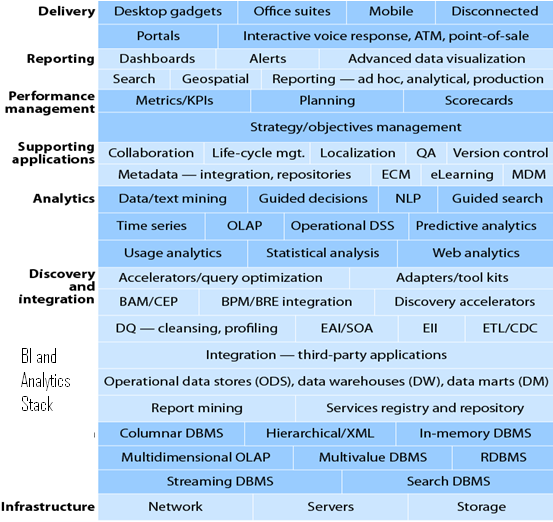 The range of sophisticated talent required across the BI Stack to enable analytics is pretty incredible. Integrating the value chain from Raw Data <-> Delivery (mobile dashboards like iPad, IPhone or Android widgets) is the new competitive battle field. There is a troubling dichotomy. The demand for people who can work with large data sets is booming. However, the supply of people is lagging considerably. To meet the demand for analytical talent is going to require the rebirth of Computational and Management Science as a field. Deja vu. In the late 1990s and early 2000s, many universities shut down their data analytics, statistics and decision sciences programs for lack of demand. Now this is a booming field. Amazing how things come back into style. It is proving to be great time to build a Business Analytics practice. Companies are gathering more data than ever before, and will find it increasingly challenging to use this data to make informed business decisions. 3. 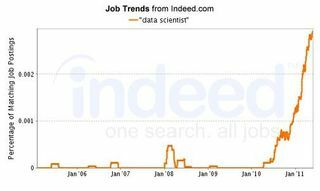 “Data Science”: what’s in a name? 4. Technical knowhow in demand — advanced nonlinear modeling and multivariate analytic techniques. These seem to yield significantly better results for businesses than traditional approaches. They are being applied in: credit and collections, fraud, marketing and cross-selling, pricing, portfolio valuation, and more. Anywhere companies seek to predict behavior, preference, or affinity is an area of significant opportunity.